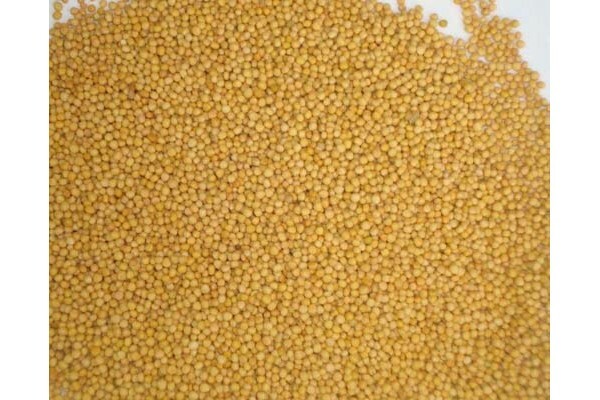 Mustard seeds are the smallest seeds of the various mustard plants. The seeds are about 3 mm in diameter and may be colored from yellowish white to black. They are important spices in many regional cuisines. The seeds can come from three different plants: black mustard (B. nigra) brown Indian mustard (B. juncea) and white mustard (B. hirta/Sinapis alba). Powdered Mustard has no aroma when dry but a hot flavor is released when it is mixed with water. Mustard Seed's hot and spicy flavor enhances meats fish fowl sauces " and salad dressings. Whole Mustard Seeds are often used for pickling or in boiling vegetables such as cabbage. Brown Mustard Seeds are an important flavoring in Indian dishes. Indians have used mustard seeds in their food for over two thousand years.The French have used mustard seeds as a spice since 800 AD and it was amongst spices taken by the Spanish on explorations throughout the fifteenth century. Aavakaaya Sasive is a variety of Indian pickle consisting mainly of mangoes red chilli powder and aavaa pindi (powdered mustard) preserved in Mustard oil is popular in South India with its origin in Andhra Pradesh.